Grand Central Station in New York. some food or just take a visit. 1913 Cornelius Vanderbilt replaced his railway station from 1871 with this enormous "city within the city" by concrete, steel and lime. It was at the same time as the train went from steem to use of electricity. The building has a beautiful vault roof and several impressive ramps who are designed to offer walkers a good connection from the street to all the trains. The building consists also of one impressive big round window who let the light into the big hall were you buy the tickets etc. The station also became a famous building when it played an important part in welcoming arrived stars from Hollywood and also during II World War when transports of troops and necessity passed here. During ending of 1970´s the train traffic wasn´t used in the same great extent. The station went to an uncertain future, but it had some luck, it was kept alive through a court decision. In 1978 the station was declared as a memorial monument. Year 1998 the station went through a big renovation. Number of departures/arrivals are between 530-550 trains per day. Today the big hall is widely famous and the inhabitants is using the big clock in the hall, as a place to meet each other. During the holiday season (November-december) the annual Christmas Fair is held in Vanderbilt Hall inside the Grand Central Terminal. The Grand Central Holiday Fair. Here you will find things associated with Christmas such as Christmas sweets, decorations, ornaments, toys, etc. 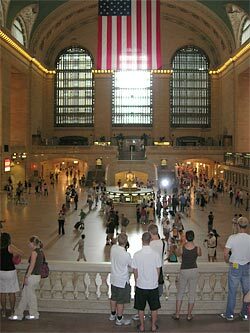 In 2013 the Grand Central Station celebrate 100 years. Between February 1 to March 15 an exhibition is held in Vanderbilt Hall, over the station's 100-year history. 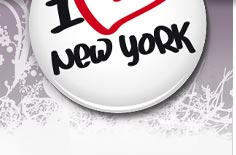 The exhibition is presented by the New York Transit Museum.